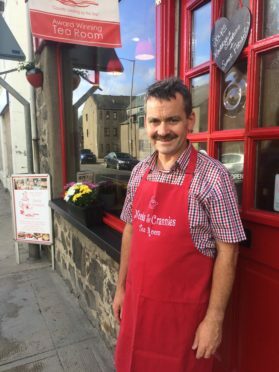 An award-winning Fraserburgh cafe is leading the way with the town rejuvenation with the shopfront given a facelift as part of the regeneration project. Nooks and Crannies in Cross Street will be the first of a string of shops to receive upgrades thanks to a grant from the Fraserburgh 2021 project. The £5.8million Fraserburgh 2021 Town Centre Conservation Area Regeneration scheme, known as CARS, started in 2017 as part of the wider Aberdeenshire Council-led regeneration of the town. The small grant was awarded specifically to improve shopfronts within the CARS. Conservation-friendly work, which will take place this month, will involve Nooks and Crannies being fitted with new windows, doors and signage created by the use of traditional joiner work, glazing techniques and materials. Cafe owner Malcolm Watson said: “We’ve received several industry awards this year. The popular eatery was recently awarded the Good Food Award 2019 Gold Seal and the Gold Standard for Elite Eats. A traditionally hand-painted sign will also be erected to spruce up the cafe front. There are 10 other projects earmarked for renovations which will take place between now and the end of the Fraserburgh 2021 project. One of those is the Penny Schoolie which now forms part of the Old Parish Church Centre on the High Street with funding announced early in October. Exterior renovations recently got underway on the building with the aim of restoring it to its former glory. It is the first College Bounds building to undergo improvement works. Regeneration Development Partnership chairman, councillor Brian Topping, said: “We’re really grateful to the funders for contributing to the small grant scheme. Funding has come from Aberdeenshire Council, Historic Environment Scotland and the Heritage Lottery Fund. Chairman of Aberdeenshire Council’s Infrastructure Services Committee, Peter Argyle, said: “As a council we have made a significant commitment to regeneration, strengthening the economy and improving our town centres.